Well, if have been reading this blog, you know that I feel blessed by my “job”. My co-workers are fantastic and our clients and their families are wonderful. I recently had an experience that reminded me how awesome our collaborating providers are. We work very closely with a particular pediatric group, they see clients out of one of our auxiliary spaces and many of families choose them as providers. I was at the hospital visiting with a family that had had to transfer during their labor. I walked into the room to find a happy, healthy Mom with a beautiful dark haired baby girl nursing away. The proud Daddy at their side. We were chatting, discussing the transfer and marveling at how great the baby was breastfeeding. After a short time, another visitor arrived…one of the pediatricians from the above mentioned group. In addition to being a great physician, he is also an avid guitar player. We had recently had a huge snow storm and it was freezing outside, so he could not leave his guitar in the car and brought it in with him. 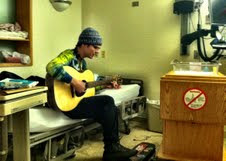 Of course, one thing lead to another and before he did the baby exam, we were gifted with a song! How many people can say that their pediatrician serenaded the baby before examining them? Truly, we are blessed to be surrounded by such wonderful people. That's so great! What a lucky little babe. ← So, you want to be a midwife?….